*This section details the setups dimension default rules at different places to override dimensions. A new form has been designed for the user, to define the initialization process. Go to Project management and accounting > Setup > Projects+ Setup > Dimension default rule. Borrowing legal entity User need to define borrowing legal entity to default dimension value for the intercompany transaction if lending legal entity does not have same account structure setup. Relation Table/Group/All relation specifying which type of filtering to be considered for the line. Project Relation The project group or project number to which the relation rule applies. Dimension name View the dimensions (e.g. cost center or expenses) that are being used by the transactions defined for the posting type. Each dimension needs to have a separate line for availing this feature. Primary Source In this field the user needs to define where the dimensions should default (e.g. worker or Project). Alternate source If the primary source does not exist for the record, or if the specified dimension value is blank, then the alternate source will be used. Fixed value If either the primary or alternate source is Fixed, then the value entered in this field will be used as the default dimension value. Added the posting types to match Microsoft Dynamics 365 for Finance and Operations transaction types for ease of setup. Below are the posting types included under the different transaction types. Activity and category are also included as dimension sources, apart from Project, worker, customer, vendor and fixed, for the transaction types. Project and contract are included as dimension sources for the project posting types. Project type of sources included as dimension sources for the project contract posting types. Project, contract and Parent are included as dimension sources for the Sub project posting types. Project, Worker, Activity and category are included as dimension sources for the Payroll allocation posting types. In a scenario when there is hour and payroll allocation document types in Dimension Default Rules and both are supporting transactions of timesheet, hour, vendor invoice and adjustment types for hours. The Dimension Default Rules defined for Hour is what will be seen in the document. Payroll Dimension Default Rules ones will be behind the scenes rules – Standard Microsoft Dynamics 365 for Finance and Operations picks up worker dimensions during a timesheet posting. There are some dimension values which are legal entity specific such as Project dimension and such dimension values are not populated on Intercompany transactions as they are entity backed. The only work around to the situation to track such dimensions is to create them as Custom dimensions. However, to add a custom dimension is to add the dimension value manually when the master record is added. 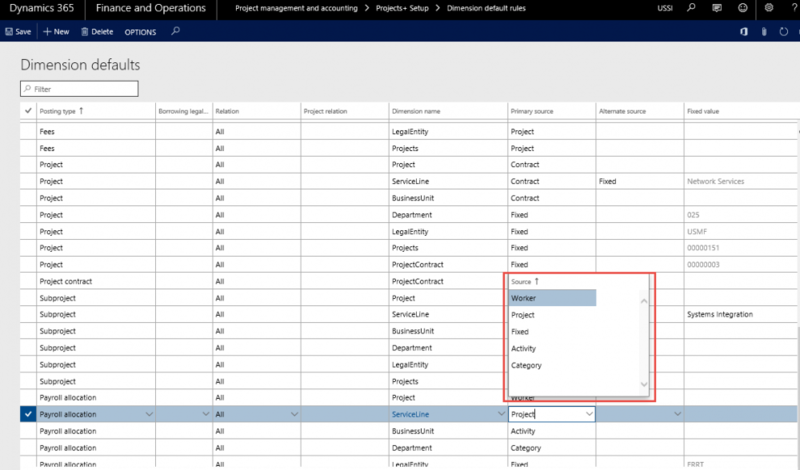 For example, if the custom dimension is projects, then every time a new project is created then the same has to be updated in the dimension value table. To make the manual creation of custom dimension value automatic this new feature has been added. Go to Project management and accounting > Setup > Projects+ parameters > Transactions > Dimension Inheritance. Select the Project Dimension which is set up as a Custom dimension. Upon selecting the custom project dimension, the project value will be populated as and when a project is created into the dimension value table for the selected custom dimension.